How Devastating is Climate Change for World Peace & Security? UNITED NATIONS, Feb 13 2019 (IPS) - When the Security Council, the most powerful body at the United Nations, met last month to discuss the growing new threats to world peace and security, the discussion veered away from international terrorism, nuclear Armageddon and the rash of ongoing military conflicts in the Middle East, Asia and Africa. And 83 of the 193 member states remained collectively focused on one of the greatest impending dangers to humanity: the devastation that could be triggered by climate change. Addressing the Security Council, Under-Secretary-General for Political and Peacebuilding Affairs, Rosemary DiCarlo, warned that climate change affects peace and security in indirect but serious ways. In the Sahel, she said, competition for resources has fuelled tensions between herders and farmers; in the Lake Chad Basin, drought has reduced economic opportunities and threatened the livelihoods of many who are turning to armed groups; and in Asia, studies have shown a link between the impact of climate change on livelihoods and the intensity of civil conflicts. In her wide-ranging interview, the Canadian Minister said as part of her country’s $2.65 billion pledge to support developing countries in their mitigation and adaptation efforts, Canada has increased its adaptation support to the poorest and most vulnerable populations impacted by climate change. This funding includes support for Small Island Developing States (SIDS), some of them, including the Maldives, Tuvalu and Kiribati, are in danger of being wiped off the face of the earth because of sea-level rise. IPS: The United Nations has recognized climate change as one of the greatest long-term challenges to international peace and security. How best would you characterize these challenges? MINISTER McKENNA: The impact of climate change goes beyond the environment. At the national, regional and global levels, climate change is having a significant effect on economies, social development and peace and security, particularly in fragile contexts where it is a threat multiplier to governance challenges. The increased frequency, severity and magnitude of extreme weather events all over the world – one of the most immediate and visible results of climate change– will likely continue to generate humanitarian crises. Canada also recognizes that women and girls are disproportionately affected by the adverse effects of the changing climate and we stress the importance of addressing their needs as countries build back better. Canada’s International Assistance and Defence Policies recognize that climate change poses a serious security challenge and must be addressed to sustain development and peace and security gains. The Government of Canada believes that an integrated approach to addressing climate change is essential to fully account for social, economic, political and security impacts globally and that multilateral consensus is key to achieving sustainable development, peace and security, noting the importance of involving women and girls in decision-making around environment and climate action issues. IPS: The countries most vulnerable to climate change are the 57 small island developing states (SIDS)—some of whom like the Maldives, Tuvalu and Kiribati, may be wiped off the face of the earth due to sea level rise and natural disasters. Do you think the international community – and specifically the United Nations – is adequately responding to these dangers with concrete actions on climate resilience and funding for adaptation? MINISTER McKENNA: Climate change is a global challenge that requires a global solution. At COP21 in Paris, the global community came together to strengthen the global response to climate change including by: enhancing adaptive capacity and reducing vulnerability to climate change; providing financial resources to support developing countries in their transition toward a lower carbon future; and holding the average global temperature increase to well below 2°C above pre-industrial levels, while striving to limit the increase to 1.5°C. With the adoption of the Paris Rulebook in 2018, all countries including major economies are moving forward with this commitment. As part of Canada’s $2.65B pledge to support developing countries in their mitigation and adaptation efforts, Canada has increased its adaptation support to the poorest and most vulnerable populations impacted by climate change. This funding includes support for Small Island Developing States (SIDS). Canada is providing $60M to establish a Renewable Energy in Small Island Developing States Program at the World Bank to support the planning and construction of renewable energy infrastructure, energy efficiency and battery storage solutions. Canada is providing $300M to the Green Climate Fund (GCF) to advance projects that support the transition of SIDS, Least Developed Countries, and African States towards clean and climate-resilient economies. Of note, the GCF is supporting the Pacific Islands Renewable Energy Investment Program in seven SIDS (the Cook Islands, Tonga, the Marshall Islands, Micronesia, Papua New Guinea, Nauru and Samoa), which is expected to reduce 120,000 tonnes of Co2 per year, while increasing the penetration of renewables in these markets. Canada is providing $30M to respond to the urgent adaptation needs of developing countries through the Least Developed Countries Fund (LDCF). As of 2016, the Fund has approved US$1B for projects in 40 countries, including nine SIDS, such as Tuvalu, the Maldives, and Kiribati. IPS: In November 2015, during the Commonwealth Heads of Government meeting (CHOGM) in Malta, Prime Minister Justin Trudeau announced grants amounting to $2.65 billion over a five year period to help developing nations in their battle against climate change. With 2020 as the expiry date, how much of these funds have been disbursed and who are the recipients? Will there be further grants after 2020? MINISTER McKENNA: Canada is delivering $2.65B in climate finance to developing countries. To date, over $1.5B worth of projects have been announced in the form of grants and concessional financing. This pledge covers FY 2015/16 to 2020/21. Funding beyond 2020/21 will require a decision from the Government of Canada. IPS: The scarcity of water, triggered primarily by climate change, is also responsible for current and past water conflicts and marine disputes, including confrontations between Israel and Jordan, India and Pakistan, Egypt and Ethiopia, Palestine and Israel, (not excluding Bolivia, Peru and Chile.). Do you think the situation will get any worse with new conflicts on the horizon? MINISTER McKENNA: Canada recognizes that water, if not governed effectively in a fair and inclusive manner, can act as a conflict driver. Water in abundance may lead to devastating floods, while water scarcity leads to drought, both of which have significant political, social, environmental and economic implications. The acceleration of climate change, the increased frequency of drought and flooding, the increasing variation in water flows, the growing volume of hydro generation necessary for agriculture, energy production and human consumption are all conspiring to make access to water, water management and water security a critical global challenge. Areas that are already struggling with challenges, such as poverty, social tensions, environmental degradation, and/or fragile political institutions, are particularly vulnerable to these changes. Canada also recognises that women are the most susceptible to bear the impacts of these changes, and of potential ensuing conflicts. In the future, problems such as water shortage, low water quality, or floods are increasingly likely to exacerbate existing social tensions. This can undermine economic development in various countries and could increase the risk of instability. However, despite the complexity of the challenges, water is also a resource for collaboration. While the past 50 years have seen approximately 40 cases of acute violent water conflicts, they have also given rise to over 150 water treaties around the world. Water-related disputes between states have typically been resolved through diplomatic channels; however, the past will not necessarily be a good predictor of the future, as climate change will increasingly amplify existing water challenges at the local, national, regional and global levels. Still, diplomatic engagement can be a tool for addressing water, peace and security challenges. Canadian diplomatic and development efforts focus on reducing instability and the human tragedy posed by climate change, including through reducing risks and increasing resiliency with respect to natural disasters, forced migration, food insecurity and water scarcity. We also believe that women should be at the forefront of our interventions addressing these issues, and we ensure that Canada’s initiatives systematically integrate gender. IPS: The threat of sea level rise, caused by climate change, could also result in a new category of “environmental refugees” fleeing from their sinking homelands to neighboring countries. Shouldn’t the 1951 UN convention be amended to include this new category of refugees? 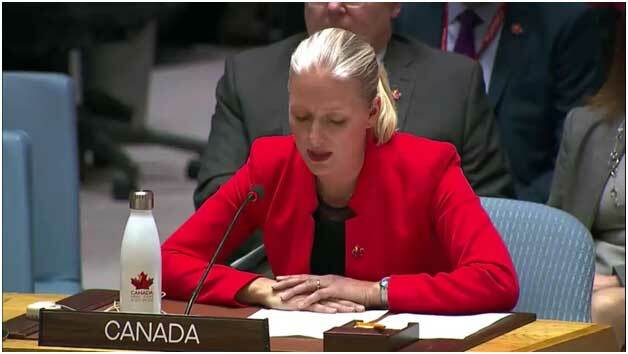 MINISTER McKENNA: Decisions on actions the Government of Canada may take in the event of natural disasters are taken on a case-by-case basis. For refugees resettled from abroad, Canada relies on referrals from the United Nations Refugee Agency (UNHCR) or another designated referral organization, or a private sponsorship group. Generally speaking, in order to be considered for resettlement to Canada, individuals must be a Convention refugee as defined in the Immigration and Refugee Protection Act. A Convention refugee is “a person who, by reason of a well-founded fear of persecution for reasons or race, religion, nationality, membership in a particular social group or political opinion, (a) is outside each of their countries of nationality and is unable or, by reason of that fear, unwilling to avail themselves of the protection of each of those countries or (b) not having a country of nationality, is outside the country of their former habitual residence and is unable or, by reason of that fear, unwilling to return to that country. For questions on amending a UN convention, please contact UNHCR directly. MINISTER McKENNA: The Pan-Canadian Framework (PCF) on Clean Growth and Climate Change is Canada’s plan to take ambitious action to fight climate change. The PCF is built on four pillars: 1) pricing carbon pollution, 2) complementary actions to reduce emissions across the economy, 3) adaptation and climate resilience and 4) clean technology, innovation, and jobs; and includes more than fifty concrete actions that cover all sectors of the Canadian economy. The PCF positions Canada to meet its Paris Agreement greenhouse gas (GHG) emissions reduction target of 30% below 2005 levels by 2030. Additional emissions reductions will come from measures that have not yet been modelled; including increases in carbon sequestered through forests and agricultural lands, investments in green infrastructure, public transit, and clean technology and innovation, as well as future actions by federal, provincial and territorial governments. In the PCF, Canada committed to become a global leader on clean technology innovation. The federal government has since announced $2.3 billion in clean technology investments, including nearly $1.4 billion in financing dedicated to supporting clean technology firms and $400 million to support the development and demonstration of clean technologies. Though 80% of Canada’s electricity already comes from non-emitting sources such as hydroelectricity, solar and wind, Canada has set a goal to increase this portion to 90% by 2030. In support of this goal, Canada has committed to invest $26.9 billion in green infrastructure, a portion of which will support renewable energy projects. Furthermore, Canada is working to reduce emissions from its existing fossil fuel fired electricity generation, passing final legislation in December 2018 that will phase-out traditional coal-fired electricity by 2030 and limit GHG emissions from natural gas-fired electricity generation.